Hair is here, workbench experimentation, upcoming building changes, and more. 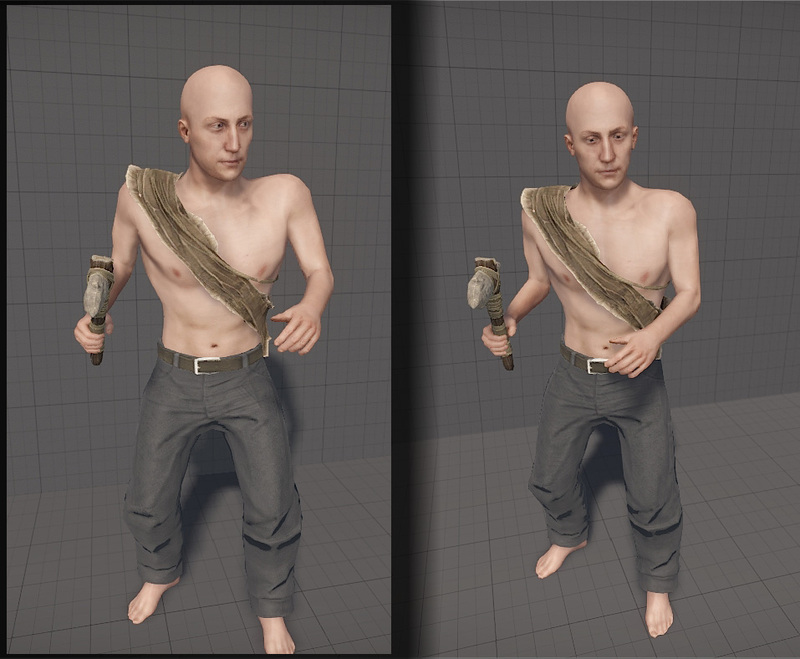 I’ve been working with Diogo Teixeira on the final few tech issues before getting hair into Rust. 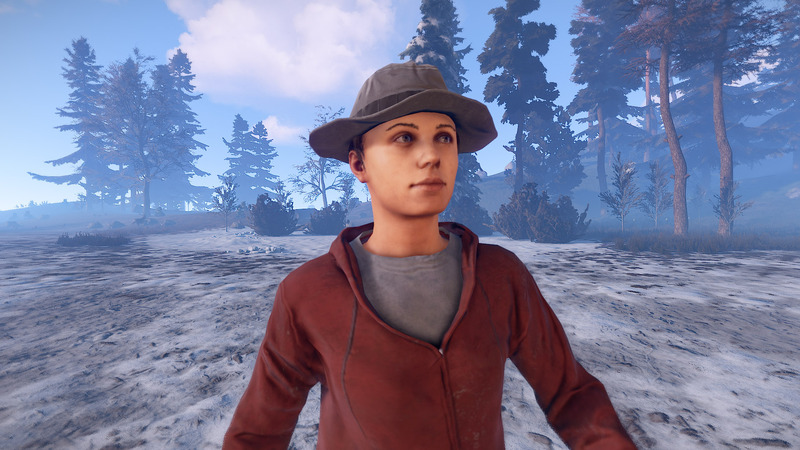 Currently in game are two hair styles per gender, two facial hair styles and eyebrow and body hair. We’ve implemented some tech to make the hair deform with player clothing and fit to all player faces. Player hair has been designed to be used with TSSAA Anti-Aliasing (found in your options). I’m continually working on updating and improving the quality of visuals both with TSSAA and other AA solutions or no AA at all. 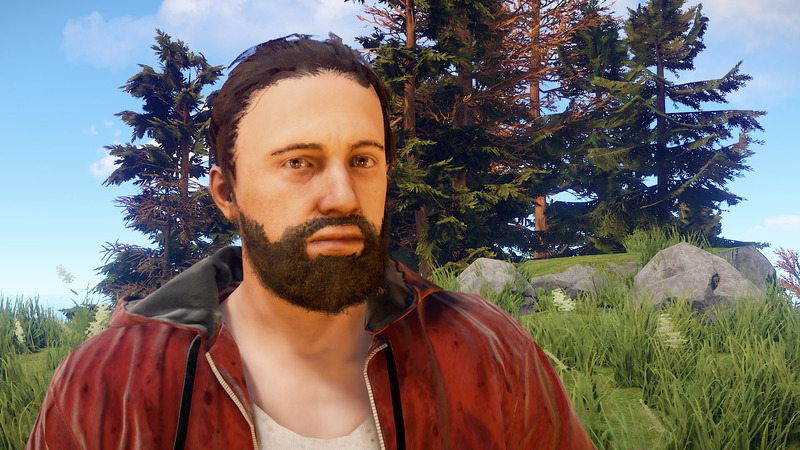 As there are a lot of hair and face combinations and it’s new tech, so there may be some bugs. Feel free to let us know if you find one. 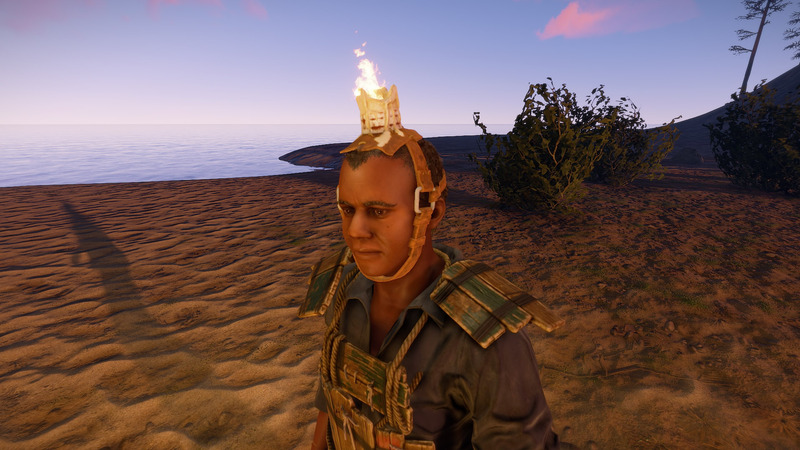 Everyone will have hair, so the trope of Rust being the game about bald psychopaths is now only half true. 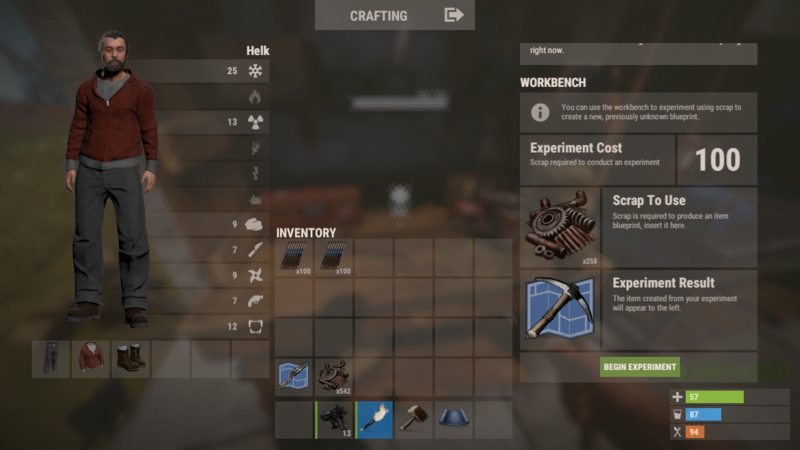 If you use a workbench, it will pop up an Experiment UI. 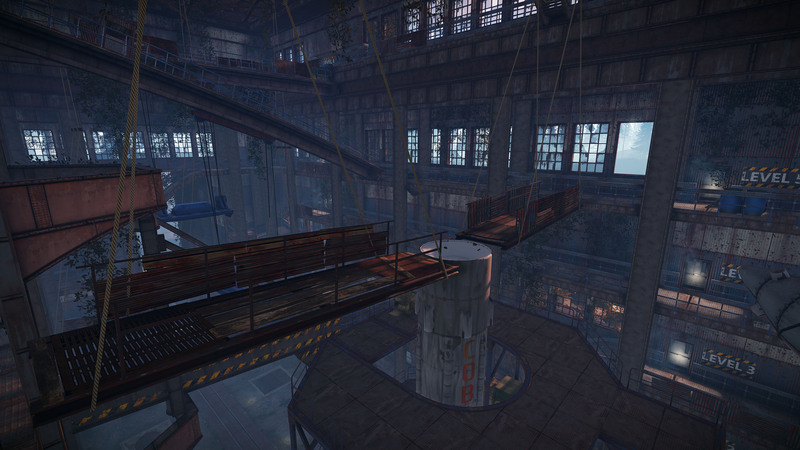 This will allow you to use scrap to experiment and produce a random blueprint relevant to that workbench tier. It checks what you’ve already learned, so there’s no chance for duplicates unless you don’t bother to study the blueprint that was just produced. The only other thing I’m considering doing would be making it so everyone unlocked everything in the same order via experimentation, but I’m not sure how people would feel about that. I’m trying to give people both options of finding random stuff and taking a shortcut by researching it, or a slower, longer, but more certain progression if you keep dumping resources into the workbench. 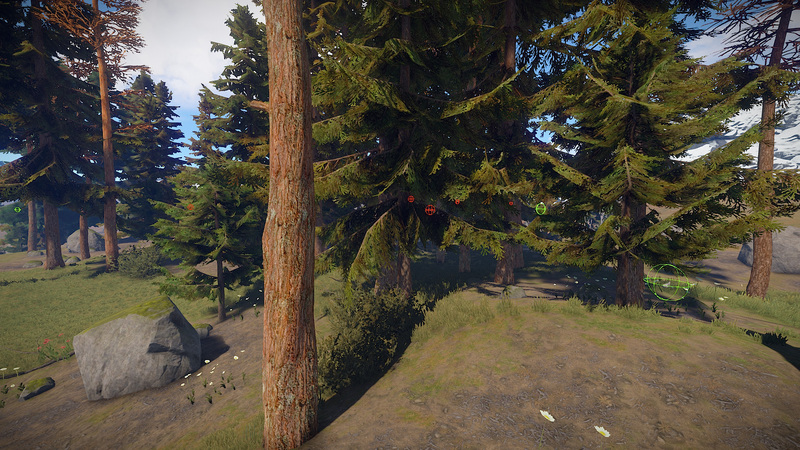 I’ve removed stance recoil from the crossbow and the hunting bow. This means they’ll behave like they used to and won’t have additional inaccuracy when moving around. I’ll spend some more time next week modifying this and attempting to remove the first shot inaccuracy when standing still and tap firing. 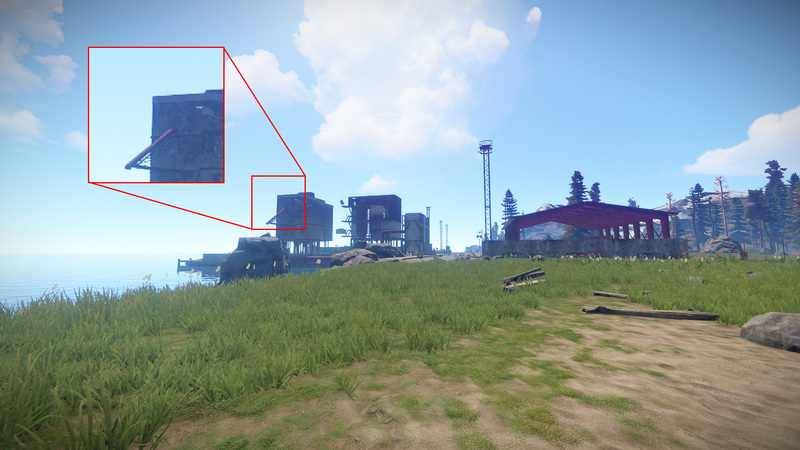 As of this patch, the nailgun nails will get embedded in objects and are also retrievable! I’ve also slightly increased the projectile ‘thickness’ of the nails, meaning you’ll land slightly more hits. 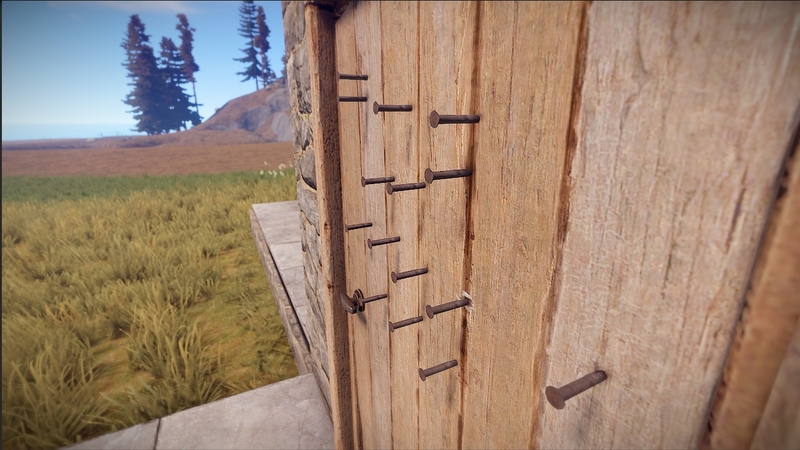 To prevent ‘nail raiding’ I’ve changed the damage type for the nails to ‘arrow’ instead of ‘bullet’, so it no longer damages wooden doors. Let me know how you feel about these changes. Our hair shading uses similar techniques to those found in games like Paragon and PUGB. There are a few reasons for it, namely rendering and shadows. Unfortunately, this means we’d be heavily reliant on temporal anti-aliasing (TSSAA in Graphics options) to get it looking decent. Introducing player hair meant we had to roll out a new temporal anti-aliasing implementation. You can expect much crisper results and less blurring in motion, at roughly the same cost as SMAA. The convar has been reset (now “graphics.antialiasing”) and TSSAA is now the default option. Made a huge breakthrough this week by eliminating one of the largest bottlenecks in our dynamic occlusion culling system, which is reponsible for hiding Players and NPCs when they’re occluded by terrain or walls. I was able to eliminate an occluder pre-pass that was necessary for the occlusion tests. A good chunk of CPU-side overhead was now cut off because of this. The only drawback of this approach is that it introduces a single frame delay in culling results. However, there are some ways to mitigate the issue using prediction techniques and I’ll be addressing it during the next couple of weeks. I believe it’s definitely worth the tradeoff. Please note that closeby entities are not affected since they’re not culled and always marked as visible. The first step was to write a new building back end that implements fast ways to query building blocks and tool cupboards for certain building IDs. 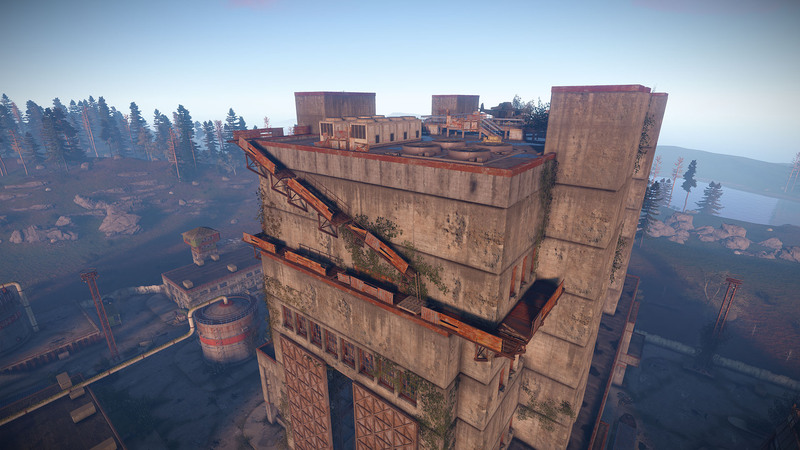 Once this was done I made the building ID update when buildings are split or joined, in order to correctly enforce the distance between buildings and be able to use the building ID to determine building privilege zones. 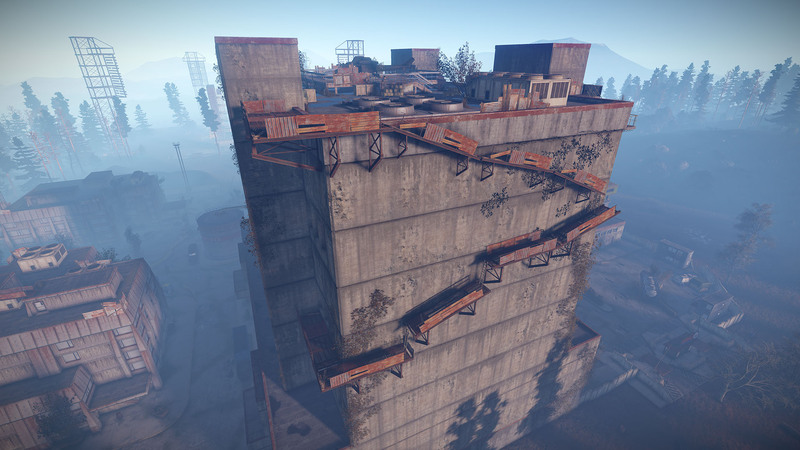 The next step will be to update the building privilege checks. so it’s emitted from the entire building instead of just a basic radius around the cupboard, and then lastly to implement the building upkeep front end. More on this next week. This week is probably going to be the last week I work on the Navmesh Grid. Technically, it has felt really close to being complete, but stabilizing it has proven really hard, and it’s stopping progress on the NPC behaviour. 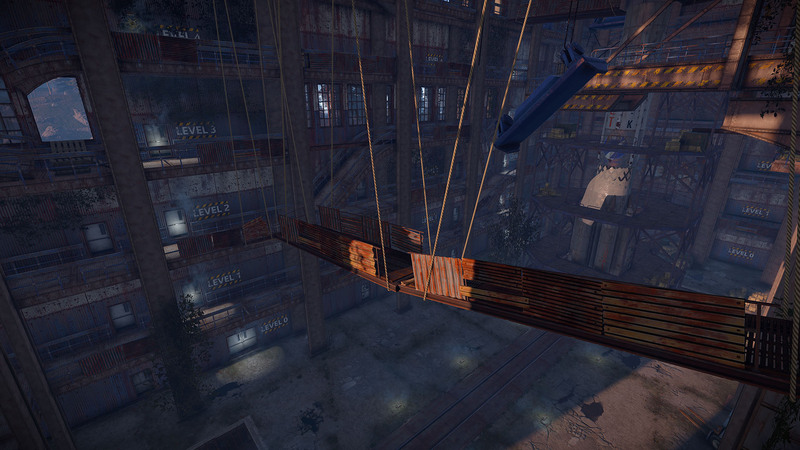 Transitions over Navmesh Links should be improved this week and NPCs should find it harder to get stuck. We are looking at alternative solutions: one of the things I have done this week is evaluate options, and we have some real alternatives within grasp for next week already. Thank you to everyone that let me know you liked the admire animations. Everyone was positive about it, so until anything more pressing comes along I’ll be continuing to make more of them. I’ve finally started to get comfortable using Houdini FX and began producing some new sprites. These sprites are a work in progress, and I’ll continue to improve upon them the better I get at using the software. I’ve been helping out with another Facepunch game for the last little bit, but jumped back over to Rust this week and finished up new sounds for the nail gun and the garage door.